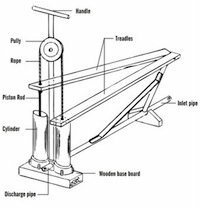 Treadle pumps are suction pumps that are used in India, Southeast Asia, and Africa by small-holder farmers for irrigating plots of land of an acre or less. They are powered by human effort, with the upper body being stationary and the legs and feet stepping up and down on treadles that are connected to two small piston pumps. If you are familiar with a stair-stepper exercise machine, these simple pumps operate in the same manner. Also, these pumps operate under the same limitations as all other suction pumps. It sits directly above the water source, like a shallow well, and can lift water from a maximum depth of about 23 or 24 feet. Since these pumps are a type of suction pump, they are most practical to use where water is somewhat more abundant and there is a water table at a shallow depth below the ground surface. Also, if surface water is available, water can be moved some horizontal distance to the field, but the pump still has the same vertical lift limitation of a suction pump. With regards to drinking water availability, these pumps can lift water from a shallow well and into a storage tank or receptacle where the water can then be accessed for filtering or further treatment to make it suitable for drinking. If rainwater is collected from a roof collection system or a ground collection system, the collected water can be pumped up to a rooftop tank using this inexpensive pump. In this arrangement, the pump is used like a transfer pump to lift the collected rainwater higher so that gravity can be used to deliver water from ground level to a household or to a gravity-fed drip irrigation system. For the most part, treadle pumps have been used to irrigate small plot farms and to help small-holder farmers increase their incomes. For a relatively small investment, growers who otherwise depend upon rain-fed crops to feed their families and produce a small profit then have the opportunity to grow high value fruit and vegetable crops during the dry seasons thereby increasing their incomes beyond what could be gotten if they had depended upon rain only. 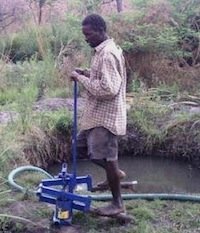 These pumps are inexpensive and cost much less than a motorized pump or most shallow well pumps. The price of an installed pump can be as low as $20 to $100 depending on the country it is in. It is obviously cheaper to operate than a motorized pump since it is human-powered and there is no fuel or electricity to pay for. New Dawn Engineering, a company in India that produces treadle pumps, tested its newest model and found that at a treadling pace of 100 strokes per minute, a 138-pound operator showed an average output of 25 gallons per minute or 1500 gallons per hour. In 1986, an organization called International Development Enterprises (IDE) began focusing on value-chain and marketing activities designed to promote the pump as a tool for helping lift poor farmers and their families out of poverty by increasing the output of their small farms. IDE’s involvement and their help in setting up pump manufacturing shops, played a large part in spreading the use of treadle pumps all over the world, but especially in India. Since 1985, 1.4 million treadle pumps have been sold to small-holder growers in Bangladesh, alone. Return to "Hand Pumps" from "Treadle Pumps"